Welcome to Cowboy Polo! Thanks for stopping by to learn more about this fun and fascinating sport for the whole family. Normally, when one thinks of the sport of Polo, things that come to mind are Thoroughbred horses, formal English riding attire, beautifully groomed fields, and lots of money, just to push a little wooden ball through the opposite team's goal. The Cowboy Polo Association brings the sport of Polo to the everyday family. The attire is blue jeans, saddles are western, and the horses are of the stock variety. Swatting a ball through the opposing team's goal is about the only similarity to its English counterpart. It doesn't take a great deal of money to participate in this game. All that is needed is a horse that reins well, some protective gear, and a rider that loves the fun of competing with fellow teammates. Cowboy Polo is a sport for the whole family. There is no age limit, and participants range in age from children to players in their 70's. The game is played in rodeo style arenas with two five player teams. Each player is armed with a mallet and the object is to knock an inflatable rubber ball through the other team's goal. Cowboy Polo is the average person's sport. You don't need a whole string of horses to participate. All that is needed is a horse, a mallet, the ability to ride, and the love of adventure. As in any sport the game is more enjoyable with good audience participation. The Cowboy Polo Association welcomes everyone, whether interested in learning the game as a participant or as a spectator. Spectators are welcome at all events, both local and national. When the game began in 1952, it was called Palmetto Polo. It was named after Palmetto, Florida. The mallet shafts were made of palm instead of from fiberglass as they are today. 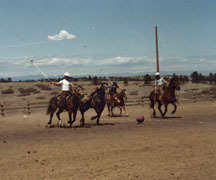 In 1959, several teams split from the Palmetto Association to form the Cowboy Polo Association, and played their first tournament in Albuquerque, New Mexico. 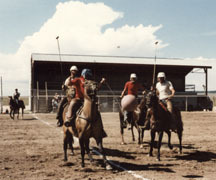 Since then, the Cowboy Polo Association has had as many as 26 tournament teams. When it was founded in 1959, the Cowboy Polo Association was organized as a non-profit for the purpose of promoting interest in the sport of Cowboy Polo. Throughout the United States many local clubs are affiliated with the national association. The local organizations have teams which compete on a regular basis, hold exhibitions, and help newcomers learn the sport. Currently, teams are mainly in the western United States; however, teams can be formed in any state throughout the country. Players and their families spend their weekends at local tournaments and come home feeling the joy of spending time together with friends as they escape from the fast paced business of the week. Every summer, teams from all over the Country get together for a national championship tournament. During the four days of vigorous competition, dirt flies, mallets swing, horses turn and sprint, and adrenaline flows. After the dust settles, one team carries home the trophy and calls itself the national champion. 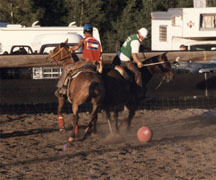 The game of Cowboy Polo is played in a standard arena. The arena consists of five zones with the center zone 60 feet in depth, the others 50 feet. Goals, located in the center of each end zone, are 20 feet wide and marked with flexible posts. The players use western tack, helmets with face guards, and padded chaps. The mallet consists of a rubber head attached to a fiberglass rod which is 48-60 inches in length. The competition consists of two teams on the field, a player from each team in each of the five zones. The 15-minute periods are called chukkers - four of which constitutes the game. There are rest periods of 5, 10, and 5 minutes. Teams change goal directions at the beginning of each chukker, and the ball changes possession after a score. A score is made when the inflatable rubber ball is whacked through the opposing team's goal. If a score is made from within the first zone, it counts as one point. If made from the second zone, two points; and if made from the center zone, three points. A game cannot end with a tie; so if there is a tie score, the game automatically goes into overtime. Each game is run by two referees, who ensure the rules are followed and determine if a score counts for one or more points. In addition, there is one goal spotter at each end of the field who informs the referees when the ball goes through the goalposts. Other game officials consist of a scorekeeper, two timekeepers, and an announcer to call the play-by-play.